Log Visualizer is a command line utility that is designed as auxiliary application for HostMonitor. Professional and Enterprise licenses for Advanced Host Monitor already include a license for Log Visualizer. Holders of a Lite or Standard licenses may purchase an additional license for Log Visualizer separately. HostMonitor may store tests results in log files (DBF, HTML, Text), also it may use user-specified database to keep history of test results. The purpose of Log Visualizer is to visualize test results for certain test item on demand. The application parses content of a log file and presents test results over period of time as a variety of charts. What is the difference between Log Visualizer and Log Analyzer? Log Analyzer provides information about all test items that are listed in the log; it creates reports for set of tests. Log Visualizer creates chart for specific test item. Log Analyzer can be used as GUI application and as command line utility while Log Visualizer is command line utility; it is designed to be started by HostMonitor or your own homemade script (nevertheless it provides some simple GUI as well). When you need a chart for single test, it's much better to use Log Visualizer because it is optimized for such tasks. Log Visualizer uses specially formatted files (repository) to store intermediate data grouped by test items on hourly, daily, weekly and monthly basis. That trick helps application to increase productivity and execution speed significantly. When you need report with charts for a large amount of test items, Log Analyzer might be preferable. Log Visualizer creates chart that shows test results over specified period of time (day, week, month, etc). Depending on command line parameters chart can be stored in specified file (GIF format) or the same chart can be displayed on screen. Log Visualizer may utilize all types of log files: HTML, Text, and DBF log files. It is also able to utilize the log records, stored in various databases using ODBC interface. When you use HostMonitor to start Log Visualizer, HostMonitor checks logvisualizer.ini file, adjusts parameters (e.g. ODBC data source parameters) and utilizes necessary command line switches to start utility in maintenance-free mode. So you just should click a button to see the chart for specified test item. -testid testID - ID of the test that should be analyzed and visualized. You may use HostMonitor's Test Info dialog to find out ID of some specific test item. If you need to know ID for all test items, you may use Custom HTML report with %TestID% macro variable in the template. -inputfile log_filename - HostMonitor's log file (HTML, TXT or DBF). When inputfile is not specified, Log Visualizer will check ODBC log setting. If ODBC log is specified, it will be used for analyzing. -outputimage image_filename - name of the GIF file. If this parameter is specified, Log Visualizer will create GIF file with image of the chart. Application will not display anything on screen. -daysback This parameter allows you to shift time interval used for the chart by certain number of days. By default, daysback is set to 0. This means chart bounds are calculated relatively to current date. If you set daysback to 1, charts bounds will be calculated from yesterday, and so on. -starttime Sometimes you may need to visualize logging data for specific period of time instead of showing test results for the last day/week/month. In such case you may use -starttime:mm/dd/yyyy command line parameter instead of -daysback parameter. -setmax <upper_limit> specifies the upper limit of the vertical axis. You may use this parameter to display the "Reply" values of the test with a different scale. E.g. for CPU Usage tests you may use -setmax:100 option to set axis of ordinates to 100(%). <upper_limit> can be specified as an integer number or a number and special suffix: Kbit, Mbit, Gbit, KB, MB, GB. Please conclude parameter in quotes when you are using suffix E.g. "-setmax:50 MB". Note: if some test results are greater than specified limit, Log Visualizer will adjust limit so all tests results will be visible. for /L %i in (1,1,9) do logvisualizer.exe -batch_mode -logprofile:logvisualizer.ini "-inputfile:c:\hostmon7\logs\0%i2007-log.htm"
for /L %i in (10,1,12) do logvisualizer.exe -batch_mode -logprofile:logvisualizer.ini "-inputfile:c:\hostmon7\logs\%i2007-log.htm"
Note: you should analyze log files in proper order, i.e. April log file should be analyzer before May log file. -setupprofile parameter tells application to load specified profile (specially formatted text file) and bring-up "Profile setting" dialog window. You may specify filename without path when profile is located in current directory (e.g. -setupprofile:logvisualizer.ini), otherwise you should provide path to the file (e.g. "-setupprofile:c:\hostmon\lv2.ini"). Note #1: if you specify non-existing file, application may create new file after user's confirmation. Note #2: HostMonitor may modify logvisualizer.ini file. If you plan to use Log Visualizer with your own scripts, we recommend creating another profile for your needs. You may use "Profile settings" dialog window to setup several profiles. 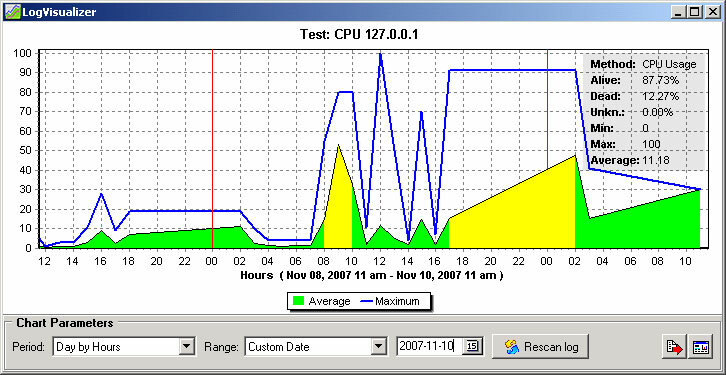 Different profiles may describe different ODBC logs and various chart setting. This way you may easily generate various kinds of charts. Chart always shows average results (reply of the test item) for each time interval (hour, day, week, etc). In addition to average reply Log Visualizer may display minimum and maximum values. These 2 options allow you to enable such series. 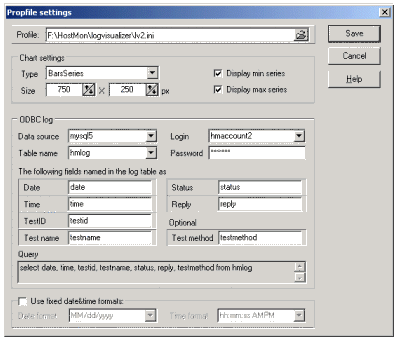 Log Visualizer may analyze log records that are stored in various databases. Before using such logs you should describe database parameters using "ODBC logs" section of the profile. Select the data source from drop-down list that displays list of all ODBC data sources installed on your system. Note: To install or configure Data Source, click Windows Start button, point to Settings, and then click Control Panel. Double-click Administrative Tools, and then double-click Data Sources (ODBC). This option defines actual fields in the table that stores tests results (HostMonitor's ODBC logging could be configured in different ways). Provide the name of field(s) that stores information about event date and time. If a single field of the table contains information about date and time, type the same name for both options. Type of the field could be Date, DateTime, TimeStamp or it can be a text field (which is not recommended). Name of the field that stores unique ID of the test. TestID is always unique within an HML file. Specify the name of a field that stores the name of the test. Specify the name of a field that stores Reply value of the test. It could be text or numeric field. Optionally you may (and we recommend doing this) provide the name of a field that stores information about the test method. By default Log Visualizer gets current Windows regional settings at startup and uses these parameters to process data/time variables. You may use this option to define the date & time formats (e.g. DD/MM/YYYY h:mm:ss AMPM). In this case, Log Visualizer will use the specified formats overriding the system settings. BTW: Changing the date format does not affect analyzing of the DBF and HTML log files. Log Visualizer is able to analyze these log files correctly regardless of the date & time settings. However this option can be useful to analyze text log files or html log files that were created by older versions of HostMonitor. When you purchase an Advanced Host Monitor PROFFESIONAL or ENTERPRISE edition you will get the license for Log Visualizer at no cost. Otherwise the license for Log Analyzer and Log Visualizer costs $45. You can order Log Visualizer using credit card, Switch and Solo debit cards, check/money order or wire transfer. If you are concerned about submitting your order and/or credit card information online, you may register the Log Visualizer via phone, fax or postal mail.